Hello world! 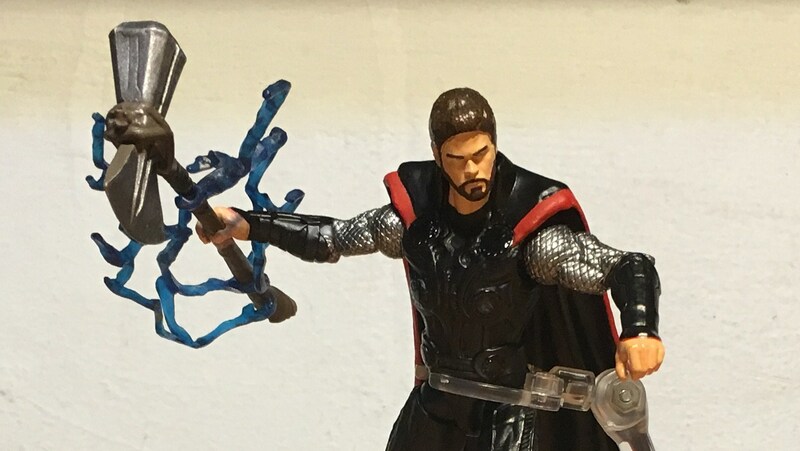 Here’s a custom MCU Thor as based on his appearance at the Battle of Wakanda in “Avengers: Infinity War”. After witnessing his brother, his best friend, and half his people, all get killed by the Mad Titan Thanos, Thor was left for dead, adrift in space until he was rescued by the Guardians of the Galaxy. Seeking a new weapon in his pursuit for revenge, Thor, together with new friends Rocket and Groot, travel to Nidavellir where Thor obtains the Stormbreaker. Thor then arrives at Wakanda on Earth, where the decisive battle for the remaining Infinity Stone was taking place between the Avengers and Thanos’ minions. 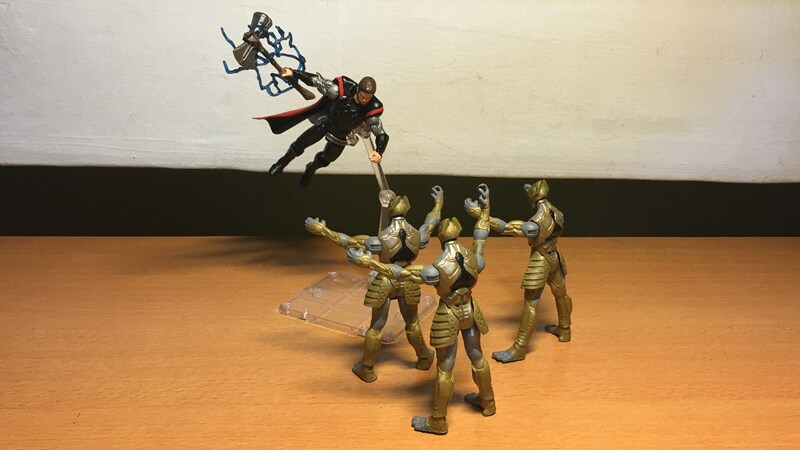 With Thor’s awesome powers the tide of the battle has seemingly turned in the Avengers’ favor. 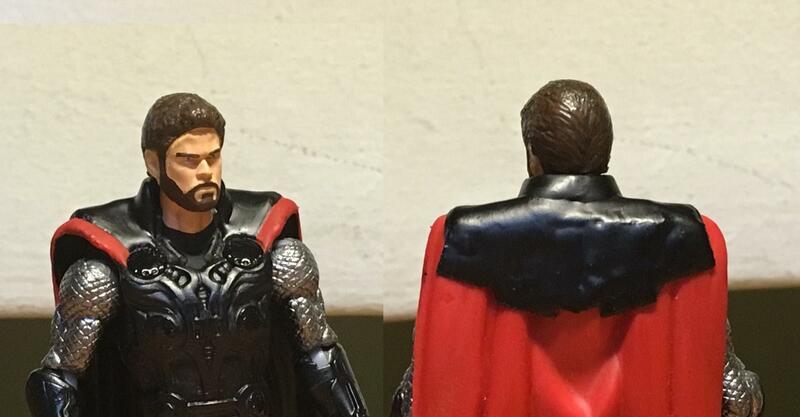 Yeah, I thought Mutt Williams’ head kinda matched Thor’s new hairdo. 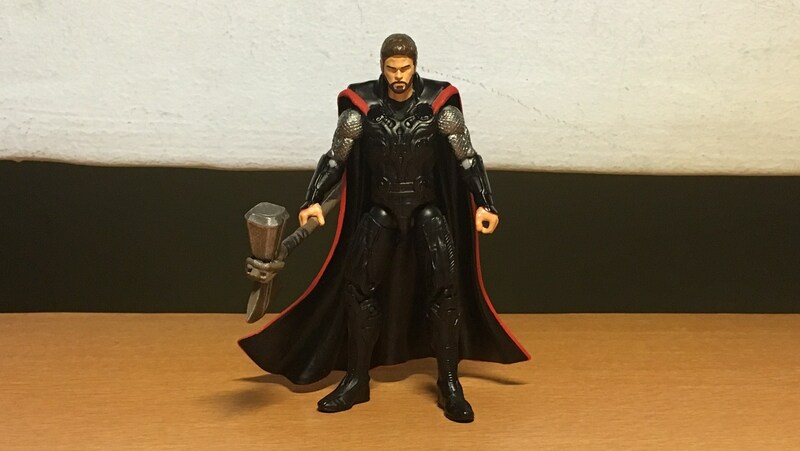 Thor’s costume in “Avengers: Infinity War” was basically an almost all black costume, with the discs having a somewhat glossy sheen. (Actually Thor already wears that right at the end of “Thor: Ragnarok”.) Epoxy putty was used to sculpt a raised collar as well as connect the cape to the top discs. A piece of paper was cut to resemble the armor plate on the back of the cape and pasted on. Epoxy was used to cover over the armor plate, collar, and over the cape at shoulders to create a continuous piece. The torso, legs, lower arms armor, and insides of the cape were painted with flat black, while the discs themselves were painted with gloss black. The upper arms chain armor were painted with gun metal to give them a shinier look. 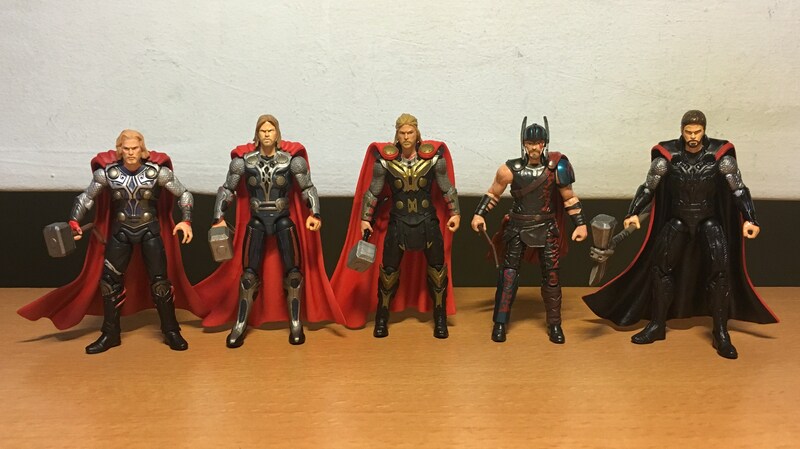 The onscreen appearances of MCU Thor. 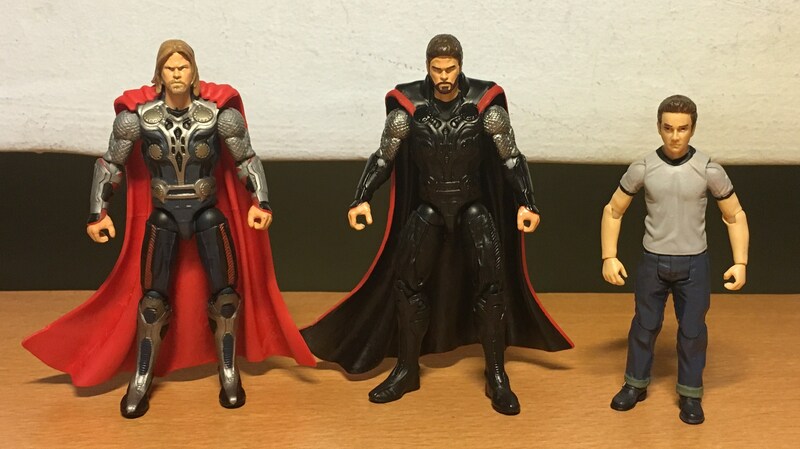 From left: “Thor”, “The Avengers”, “Thor: The Dark World” (and I think it’s almost the same costume in “Avengers: Age of Ultron”), “Thor: Ragnarok”, “Avengers: Infinity War”. 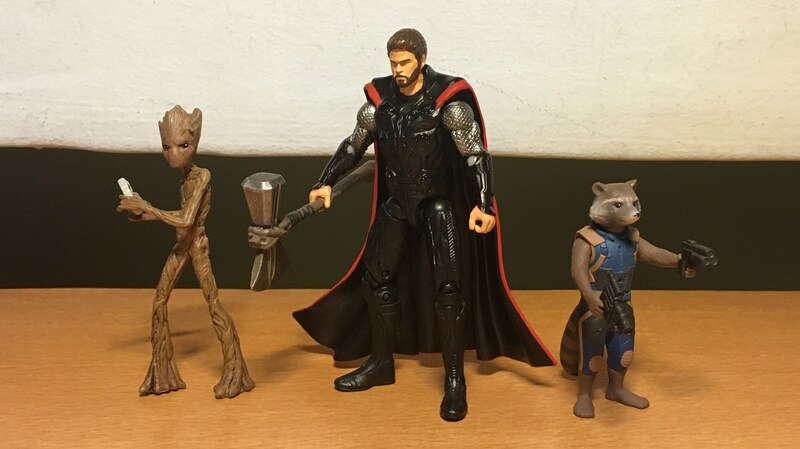 Thor, Rocket Raccoon and Groot arrive at Wakanda. The Chitauri are about to get hammered. 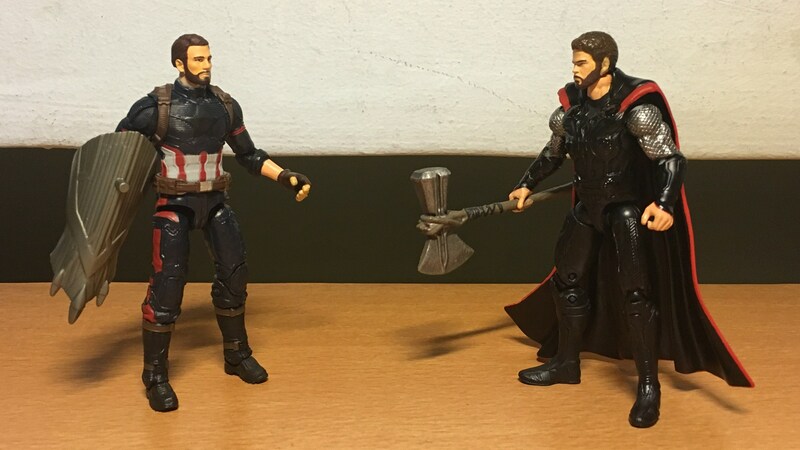 Steve Rogers and Thor do some quick catching up during the fight. 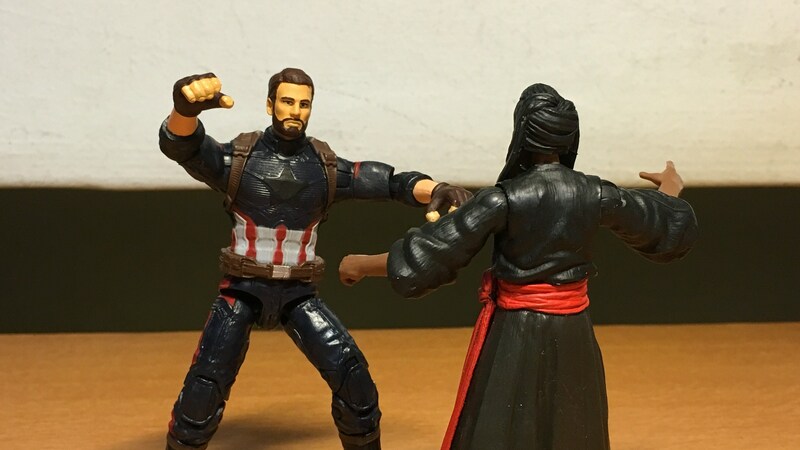 My customs for the Battle of Wakanda. Oh yeah, I’m good. 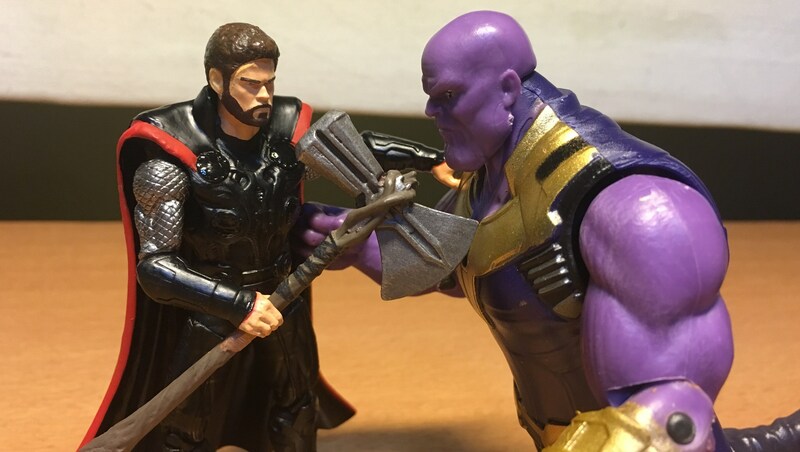 Thor confronts Thanos. You should have gone for the head!
. Rocket Raccoon is made by Takara Tomy.
. Stormbreaker lightning effects belong to Star Wars Mace Windu.
. Captain America’s Wakandan shield came with the Captain America of Hasbro’s A:IW “Infinity Stones” series of 6″ figures that came with stone accessory.
. And Thanos is a bootleg which seemed to be more in scale with the 4″ figures. Try eBay. Hello world! Welcome to the year 2019! And this is my first blogpost for the year. 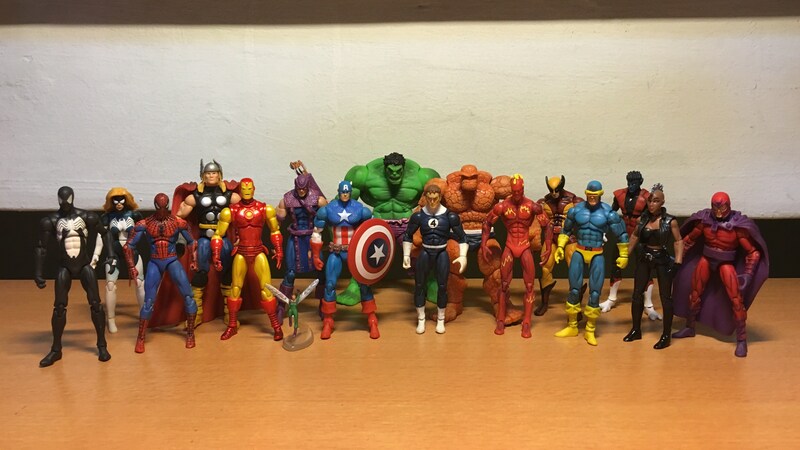 Actually, the topic for this post comes from a line I wrote in my previous post, which stated that more characters that had appeared in Marvel Comics’ Secret Wars (the 1984-1985 comics series) have since received figures of their own, apart from the original 24+1 figures that were released as part of Marvel Universe Secret Wars Two-Packs. 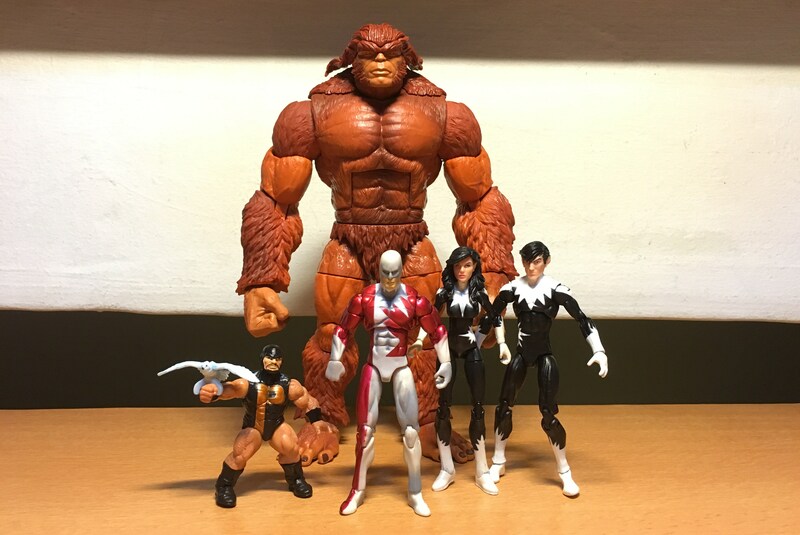 Figures from the Marvel Universe Secret Wars Two-Packs. That line made me wonder as to exactly how true was my statement, and I decided to find out. A comic panel of the heroes when they were first taken to Battleworld. 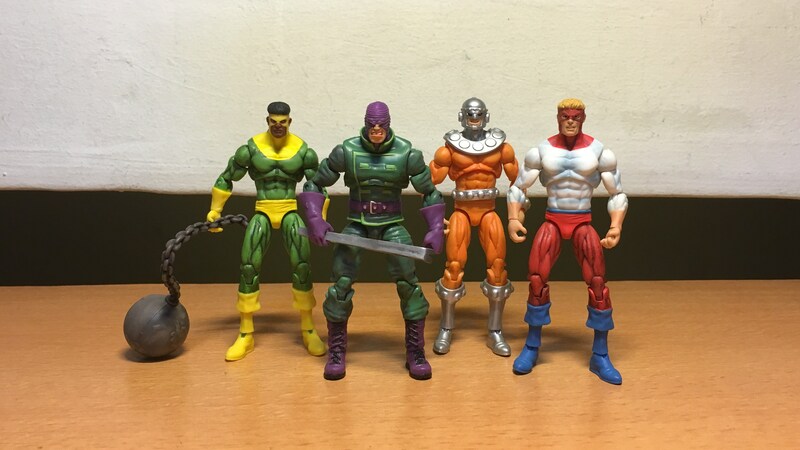 Heroes figures from MU Secret Wars Two-Packs. 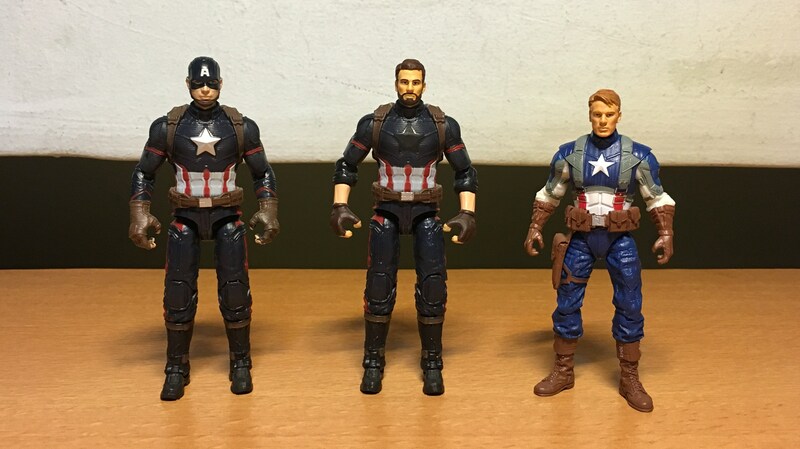 Comparison between the pics shows that the following heroes have their figures from the two-packs: Spider-Man, Thor, Iron Man, Wasp (a mini-fig), Hawkeye, Captain America, Hulk, Mr. 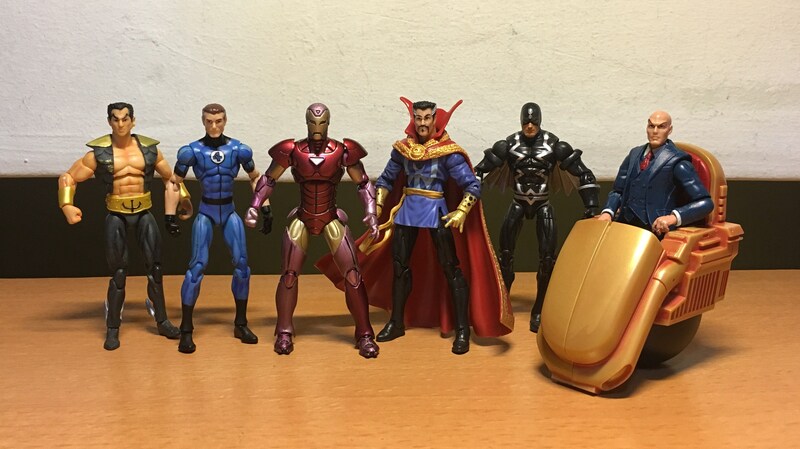 Fantastic, The Thing, Human Torch, Wolverine, Cyclops, Nightcrawler, Storm, and Magneto (usually a villain but he’s considered a hero for now). Spider-Woman made her first appearance much later in the story so she wasn’t in the initial heroes ensemble shot, while Black Spider-Man is actually Spider-Man himself when he changed into an all black costume. 1. Professor X comes from the Marvel Universe line (Series 4 #022). 2. 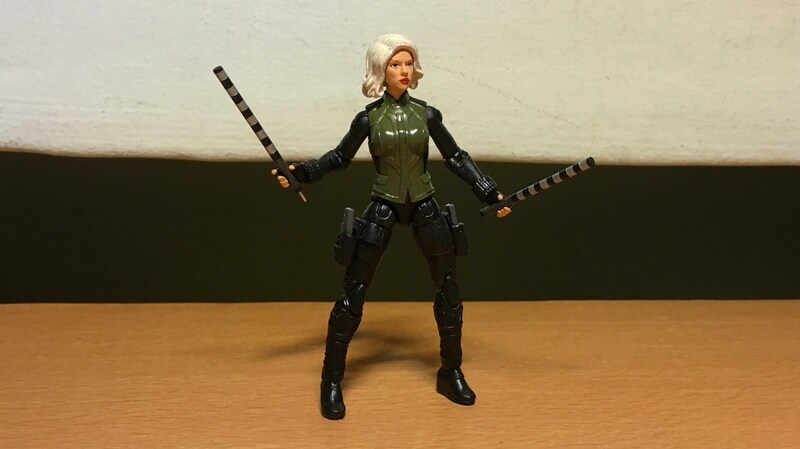 This Rogue comes from the Marvel Legends Series Wave 3. 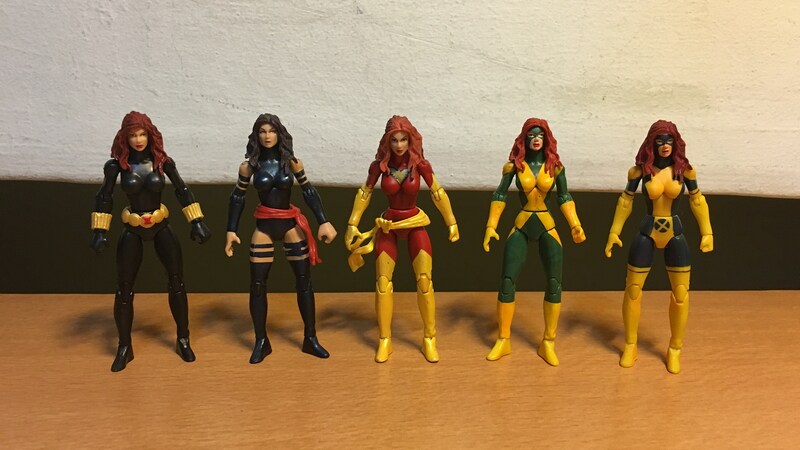 There’s another Rogue that belongs to Marvel Universe The Uncanny X-Men Team Pack, but the pictured Rogue is closer to the Secret Wars time period. 3. This She-Hulk comes from this Marvel Universe Comic Pack. There’s another She-Hulk from Marvel Universe line (Series 4 #012), but the pictured She-Hulk is closer to the Secret Wars time period. 4. This Colossus comes from the Marvel Universe Giant Size X-Men Box Set. There’s another Colossus from Marvel Universe line (Series 2 #013), but the pictured Colossus has the same pointed shoulders and yellow knee pads as appeared in Secret Wars. 5. 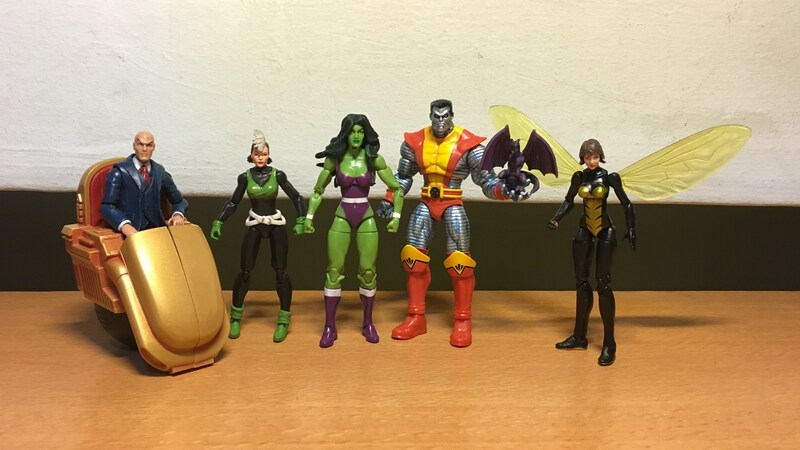 Lockheed the Dragon came with Kitty Pryde of the Marvel Universe line (Series 2 #017). 6. 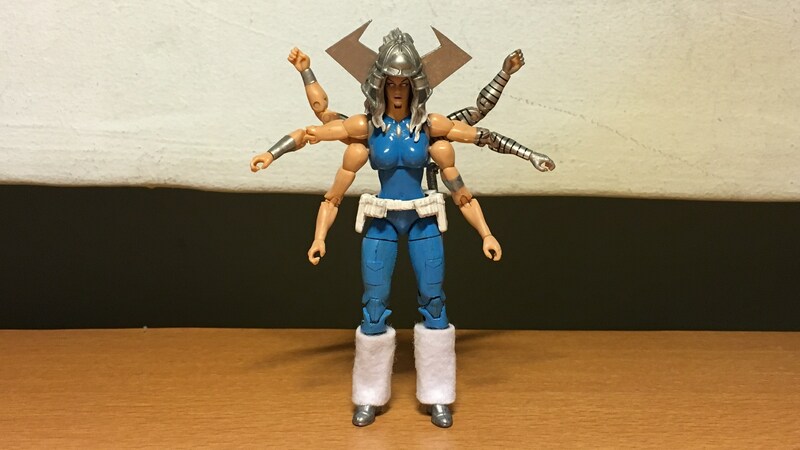 A 3.75″ figure of Wasp was also released, as part of the Marvel Infinite Series Wave 1. But she is in a more recent costume, not in the classic green costume with a purple “W” as seen in Secret Wars. The comic panel of the villains when they were first taken to Battleworld. 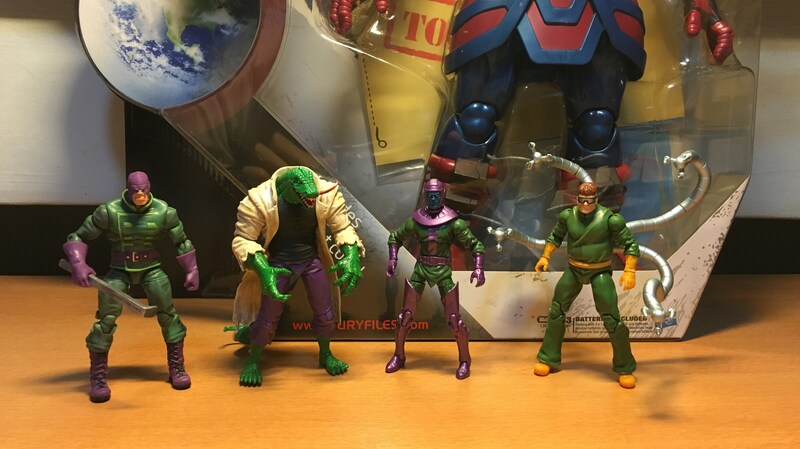 Villains figures from MU Secret Wars Two-Packs. 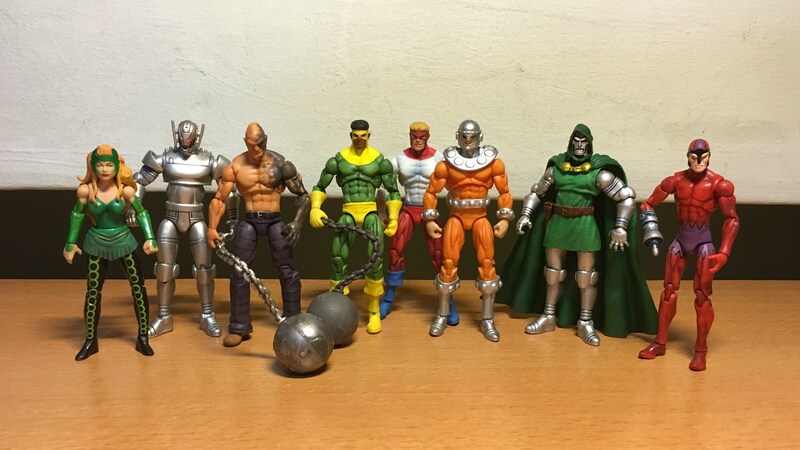 Again, comparison between the pics shows that the following villains have their figures from the two-packs: Enchantress, Ultron, Absorbing Man, Thunderball, Piledriver, Bulldozer, and Doctor Doom. Klaw did not appear in the story until later so he’s not in the initial villains ensemble shot. That leaves the following outstanding villains without their figures: Wrecker, Doctor Octopus, Lizard, Kang, Molecule Man, and Galactus. In addition, two other villains also later made their appearances in Secret Wars: Volcana, and Titania. So, do we also have figures for them as well? 1. Wrecker comes from the Marvel Universe line (Series 2 #020). 2. The Lizard comes from the Spider-Man 2010 Classics 3.75″ Wave 4. 3. Kang the Conqueror comes from the Marvel Universe line (Series 4 #015). 4. Doc Ock comes from the Marvel Infinite Series Wave 6. 5. Galactus is a Marvel Universe 2010 SDCC Exclusive, and he was later repackaged for retail sale. 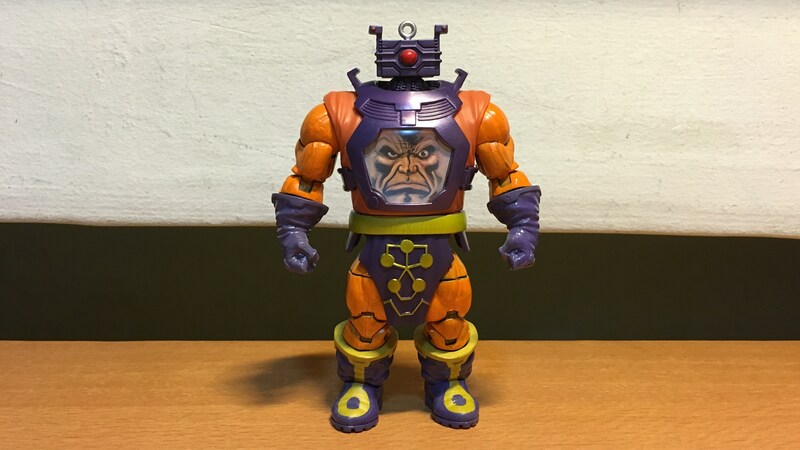 A darker colour variant of Galactus was also released for retail. 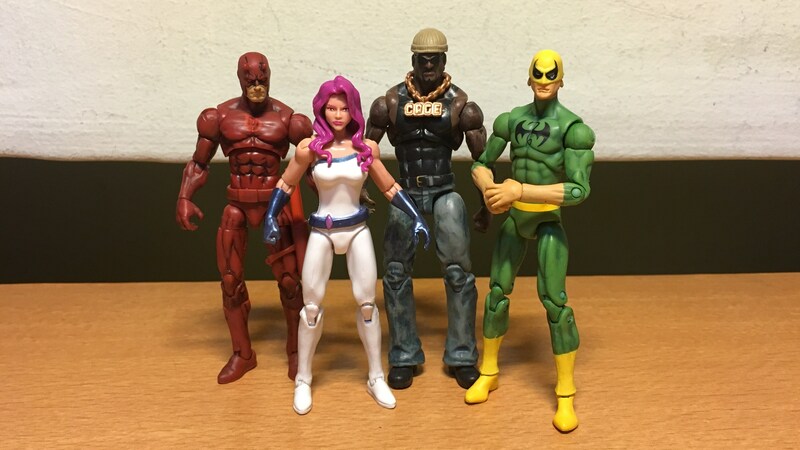 Here’s hoping that when Hasbro ends its current hiatus on 3.75″ Marvel Comics figures, the remaining Secret Wars characters will be produced. 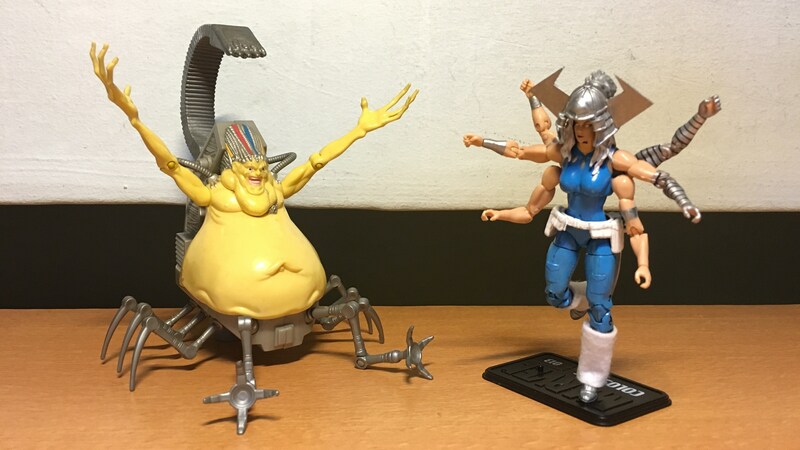 A couple of scene re-creation from Secret Wars. 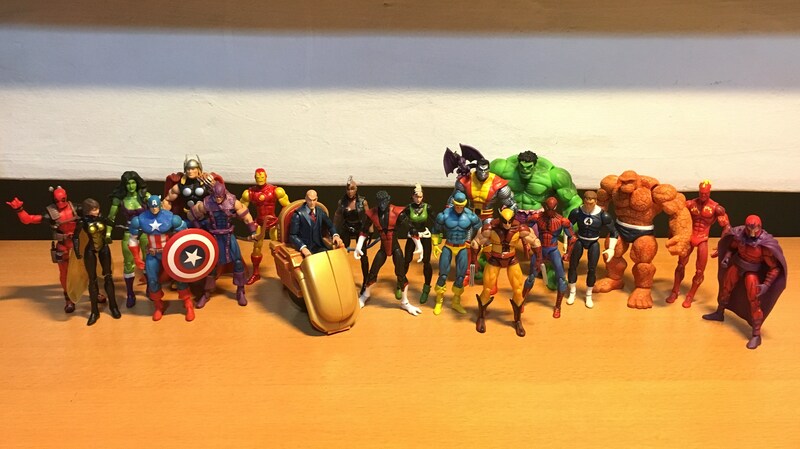 The heroes lineup, with the addition of Deadpool, who claims to have also participated in Secret Wars, except that nobody remembered ever meeting him. The villains lineup. We are missing the Molecule Man here. Hi world! We have come to the end of another year, and I thought I’d showcase a couple of items from my awesome toy collection that I had acquired over the course of the year or even earlier. And I’ve decided on doing this showcase with the theme of Marvel Universe Teams and Groups. The Illuminati: Namor, Reed Richard (aka Mr. Fantastic), Tony Stark (aka Iron Man), Dr. Stephen Strange, Black Bolt, and Professor Charles Xavier (aka Professor X). They were brought together by Tony Stark to exchange information and deal with potential crises, each providing their own unique viewpoints and perspectives. The Fantastic Four: Reed Richard (aka Mr. 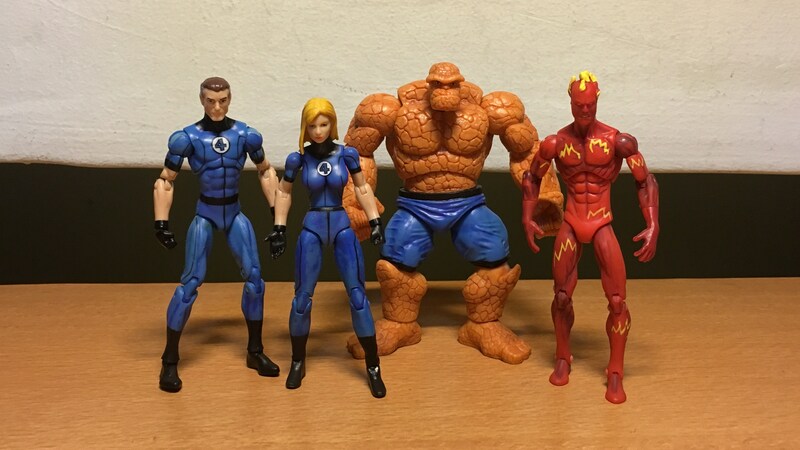 Fantastic), Susan Storm (aka Invisible Woman), Ben Grimm (aka The Thing), and Johnny Storm (aka Human Torch). The four of them were on a outer space mission on Reed’s prototype starship when they were hit by cosmic rays. Each received special powers: Reed could stretch his limbs and body, Susan gained the power of invisibility, Ben Grimm turned to a powerful rock guy, and Johnny could ignite into flames. Together they decided to put their powers into good use by forming the Fantastic Four. Netflix had a couple of TV series set in the Marvel Cinematic Universe, based on some of the superheroes not yet used in the MCU movies. And in “The Defenders”, the four superheroes team up to combat an ancient evil when it threatens New York City. The Wrecker is a criminal who was bestowed with superhuman strength and stamina, and he shared his power with three other persons. Together the four supervillians engage in criminal activities, usually as hired thugs, and quite often laying waste to entire city blocks. And I’d thought I open up my remaining Marvel Universe Secret Wars Two-Packs that were still unopened, and take this awesome ensemble. 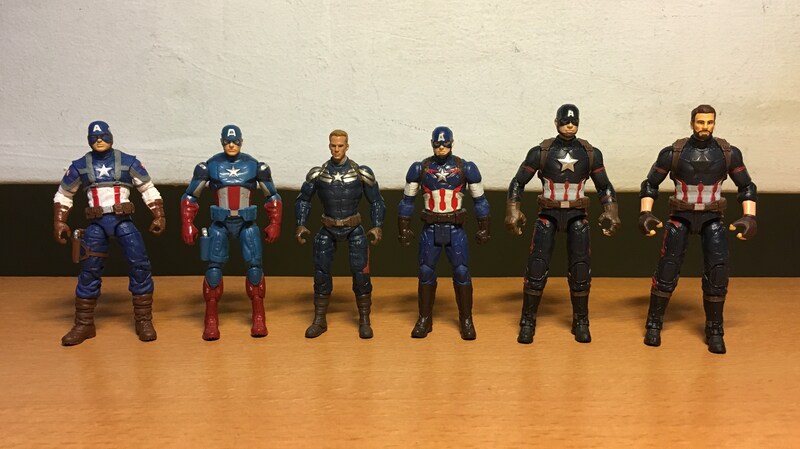 There were twelve two-packs, giving a total 24 figures. 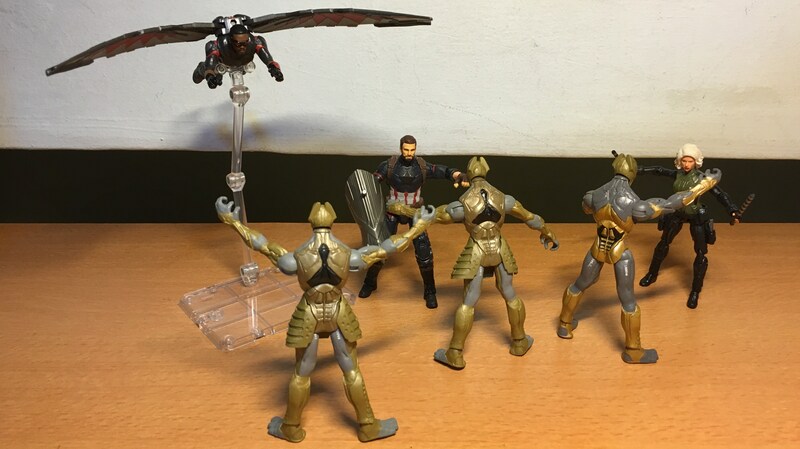 And including the Wasp, that gives 25 figures. Interesting trivia: That’s not Tony Stark in the Iron Man suit. Tony was having issues with alcoholism at that time, and asked his buddy James Rhodes to cover for him. 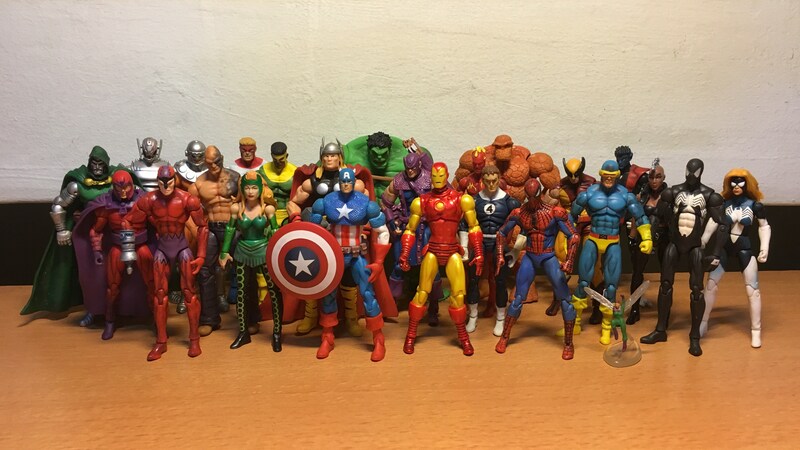 There are actually more characters that appeared in “Secret Wars” by the way, with some of them released as figures of their own later on. And with that I’m signing off! Goodbye 2018! And Hello 2019! 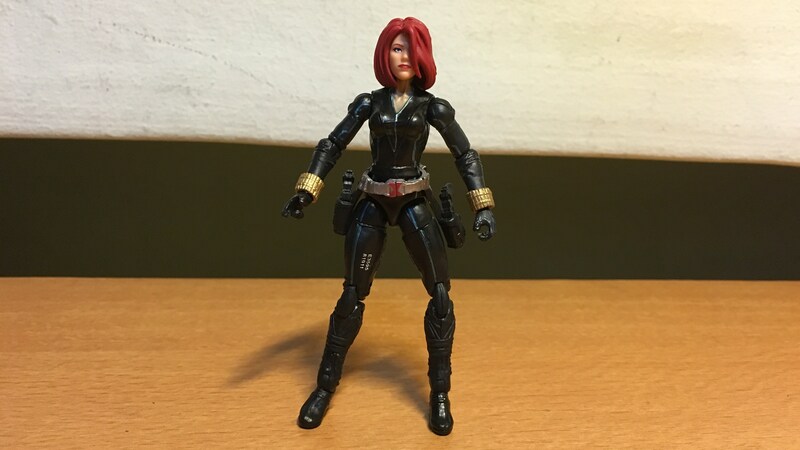 I have customized a MCU Black Widow figure based on her appearance in “Avengers: Infinity War”. Having allowed Captain America and Bucky to escape during the fight at the German airport, Natasha Romanoff was marked for arrest and she goes on the run. Dyeing her hair platinum blonde to change her appearance, Black Widow joins up with fellow rogue Avengers – Captain America and The Falcon – as they continue their fight against formidable threats to world peace. 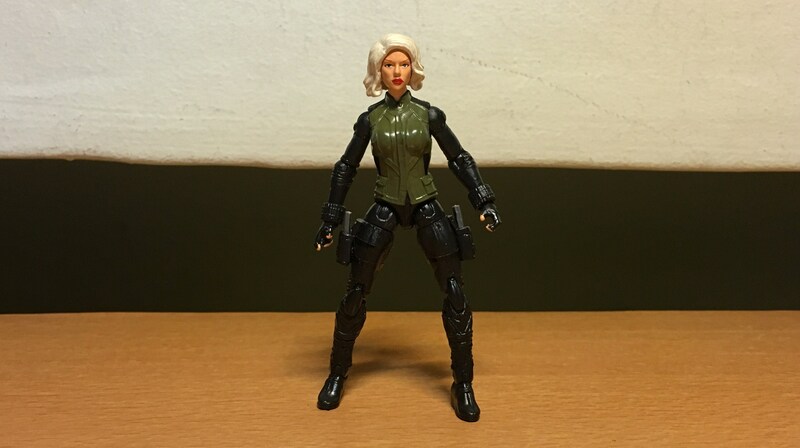 In “Avengers: Infinity War”, the Black Widow wears a green vest that I thought somewhat resembled that of the Agent 13 figure. 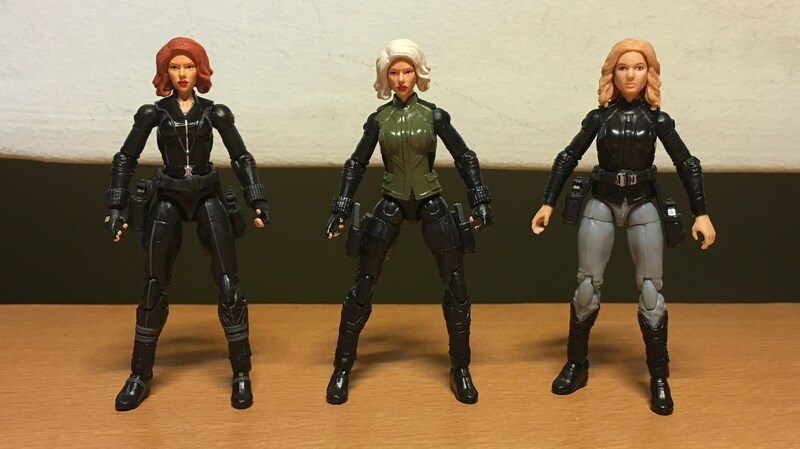 Even though Agent 13’s legs were the same design as that of Black Widow’s, I have transplanted Black Widow’s legs to the torso so as to save myself the trouble of painting. The holsters were cut from the belt and pasted directly on the legs. The hair was painted blonde to match the spy’s latest hair colour. For accessory, I have created Black Widow’s batons, using black cotton sticks painted with silver and black stripes. The batons attach to become a fighting staff. 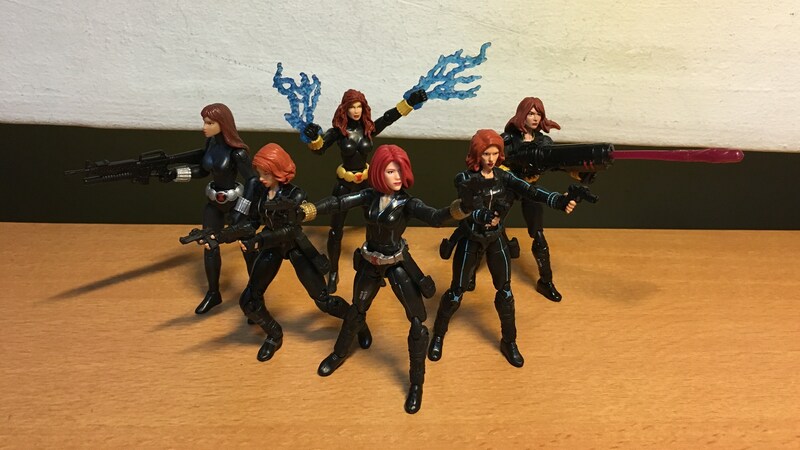 Black Widow’s secondary weapons are these “disc shooters”, which were cut out from a piece of black plastic. 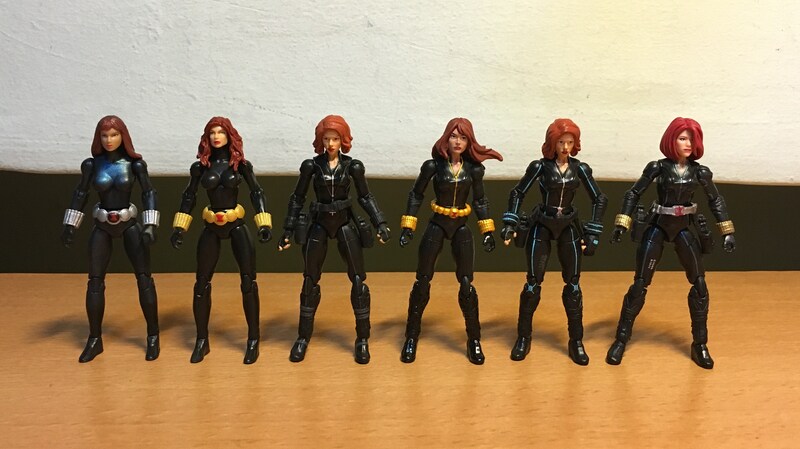 The onscreen appearances of MCU Black Widow. 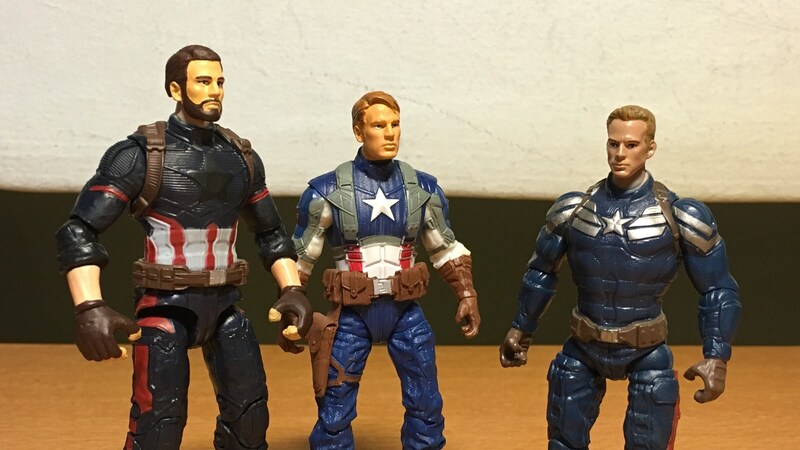 From left: “The Avengers”, “Avengers: Age of Ultron”, “Avengers: Infinity War”. 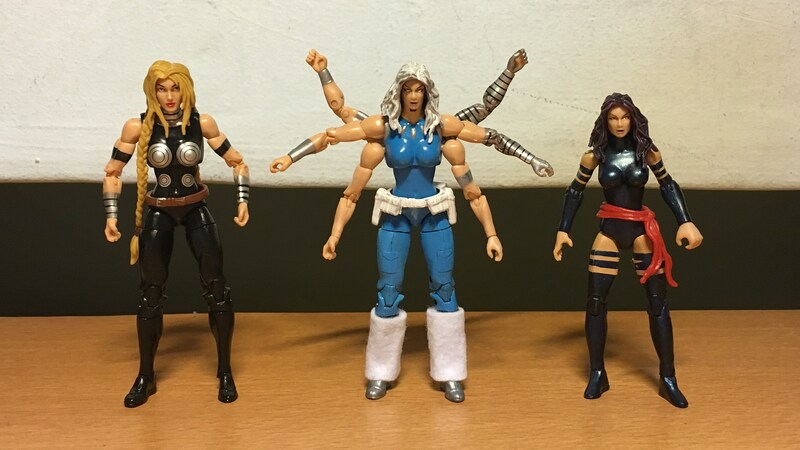 Snap….. . . . . . . . . . .
Here’s a custom Marvel Universe that I have recently created – Spiral ! 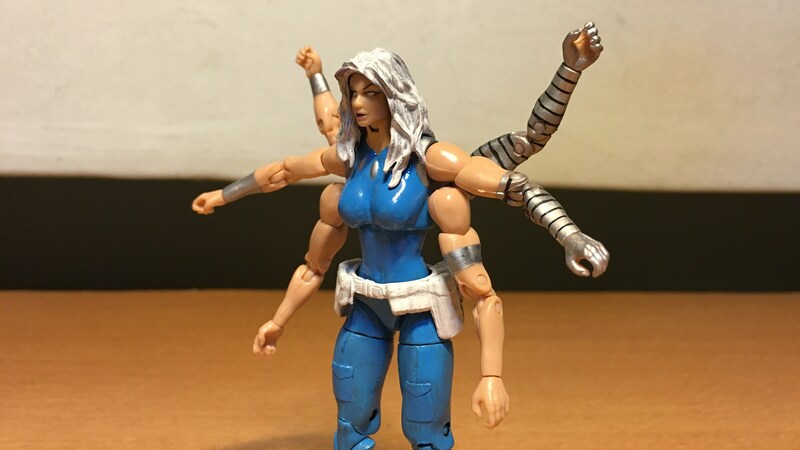 The six-armed, part-flesh part-cybernetic Spiral is a recurring adversary of the X-Men, she is also more commonly known as the agent of the slave owner Mojo, the ruler of “Mojoverse” – a dimension where all beings are addicted to Mojo’s television programs. As Mojo’s loyal subordinate, Spiral carries out her master’s commands, using her power of sorcery, endowed upon her through genetic modification and cybernetic implants. I was rather inspired to create a custom Spiral after seeing someone else’s custom Spiral posted on the ToyArk Forums from this post on this page. 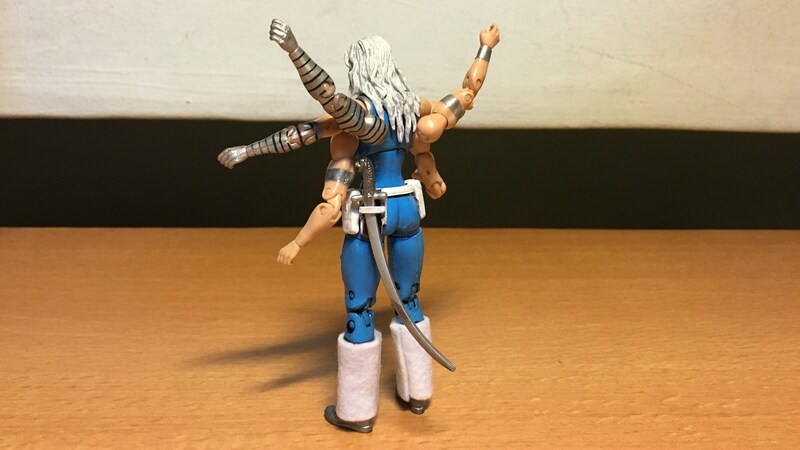 The most distinctive feature of Spiral are her three pairs of arms. Holes were dremeled on the torso’s back and sides such that the arms can be plugged in. This also involved quite some trial and error to ensure the arms do not look unevenly placed. Additional work involved adding pockets on her legs, sculpting the necklace beads, paintwork on the main body, arms, hair and eyes, and creating the belt using the ammo pouches from the German Soldier. The patterning on the cybernetic arms were created via painting with masking tape. In most online pictures of Spiral, there’s sometimes a scabbard hanging from her belt. For my custom, I have transplanted a sword holder from a Thuggee Guard onto the belt, which somewhat serves the same purpose. White felt was used to create Spiral’s fur boots. Spiral does a dance to cast her spells. Spiral faces off with Longshot, a former slave of Mojo who now leads a revolt against his former master. 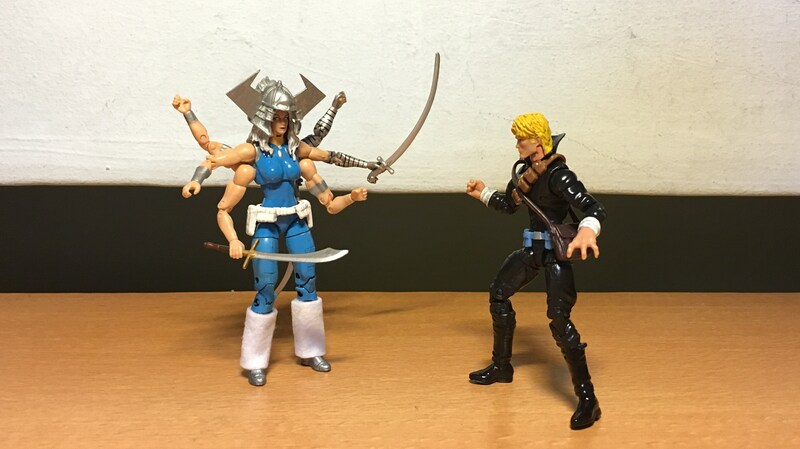 For some reasons Spiral holds a peculiar hatred for Longshot. Yeah, Spiral also fought with these guys. Just where do all her weapons come from? Hi world! 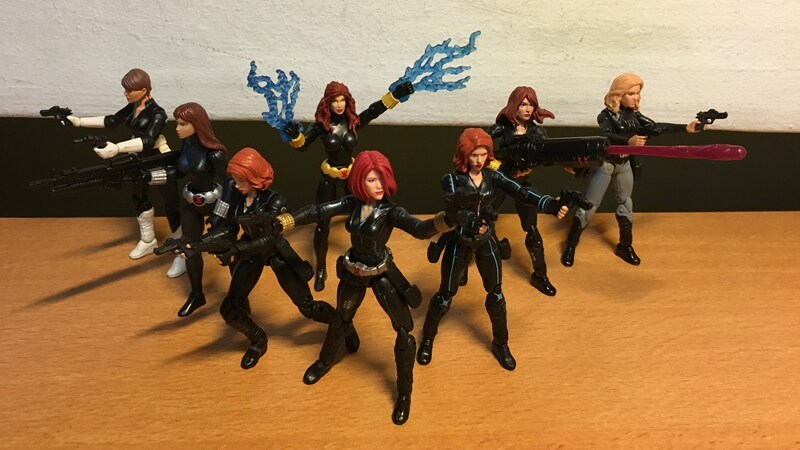 It had been a very busy month, but I’ve managed to think of a topic to blog about, and here I present to you the latest showcase from my awesome toy collection: The 4″ releases thus far of Marvel Universe’s Black Widow. 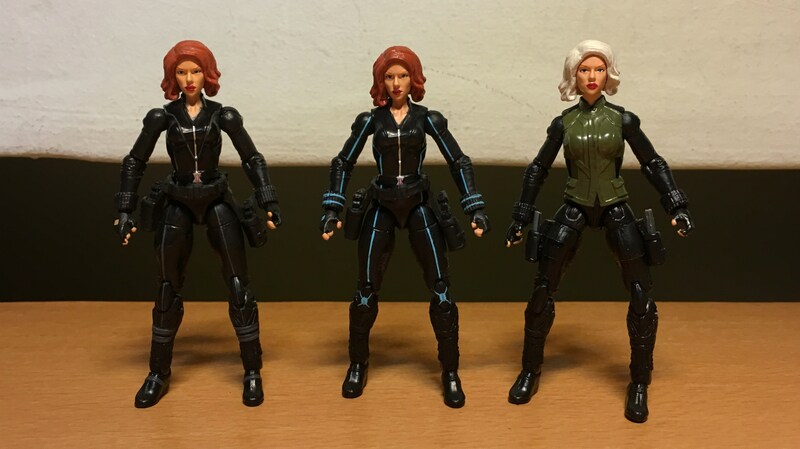 Black Widows assemble! We have six Black Widows here. In the Marvel comics, Natalia Romanova was a Soviet spy who was trained from young in the skills of espionage, assassination, marksmanship and the martial arts, brainwashed and indoctrinated in the Communist system, going by the codename “Black Widow”. However, after a couple of missions in the United States she decides to defect and work for S.H.I.E.L.D. 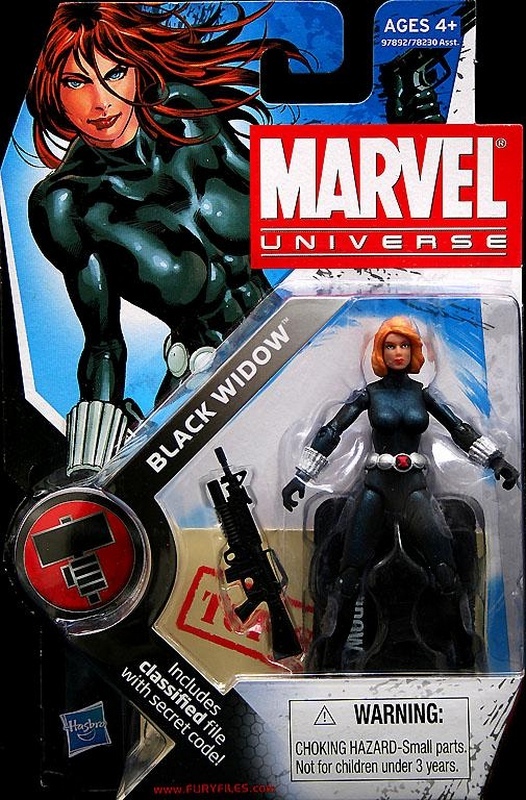 Black Widow also goes by the name “Natasha” which is an informal version of “Natalia”. 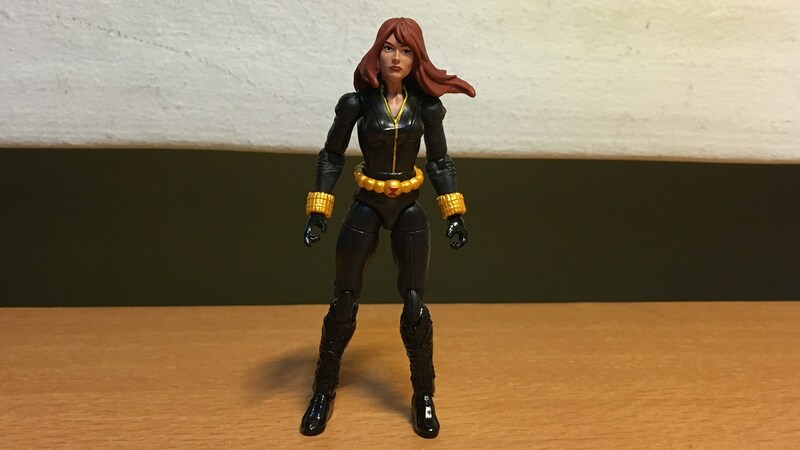 Another Black Widow with a different appearance was released as part of the “MU Avengers with stand” line. 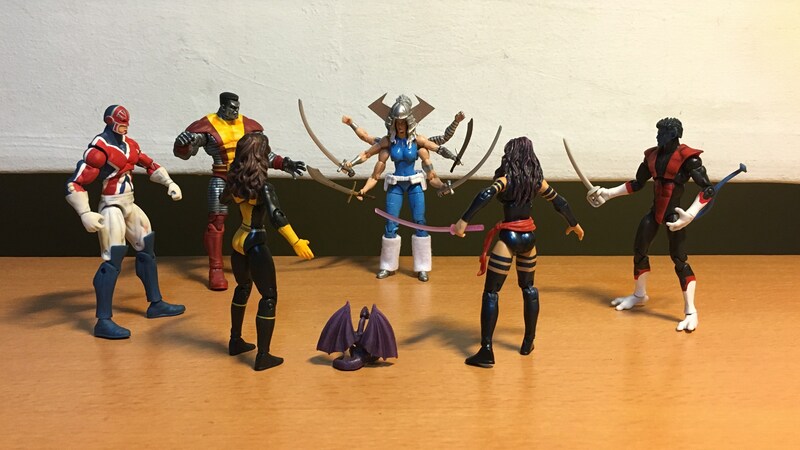 She shares the same head (and the same buck) as Psylocke, and a couple of Jean Grey variants. Yep, it’s the same head and buck. 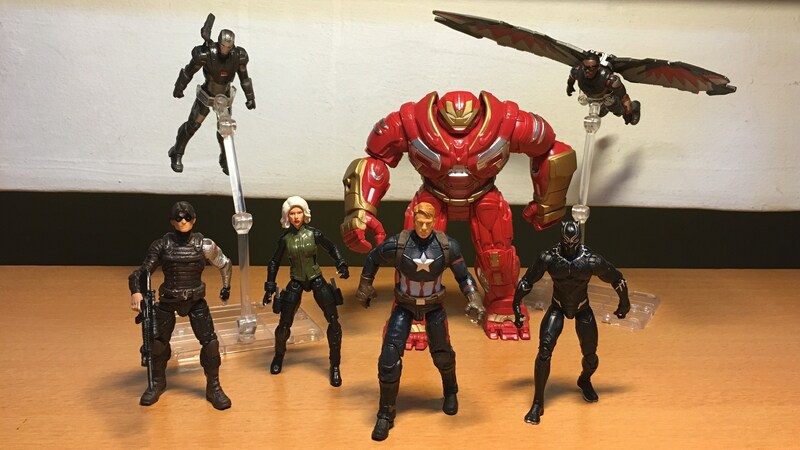 MCU’s Black Widow was released as part of “The Avengers” line. 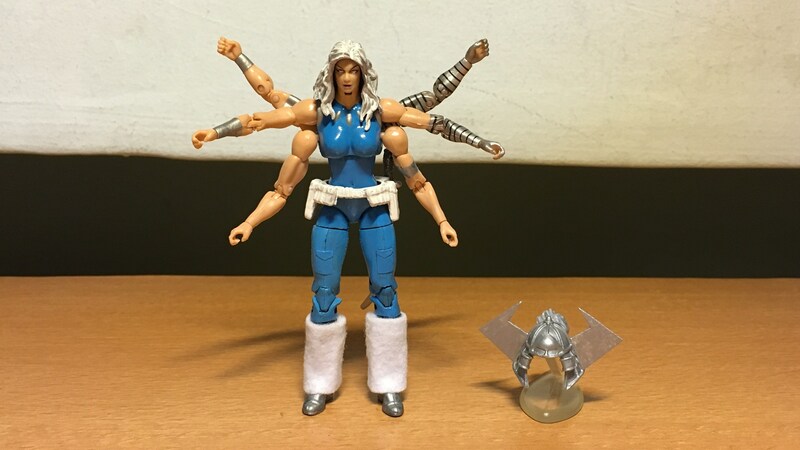 For “Avengers: Age of Ultron”, the same figure was re-released, this time she’s given blue highlights as per her appearance in the movie. In the movies the Black Widow’s real name is Natalia Alianovna “Natasha” Romanoff, which is somewhat inconsistent with the Russian family name system of using the feminine form “Romanova” for females. This is Black Widow’s appearance in the animated series “Avengers Assemble”. 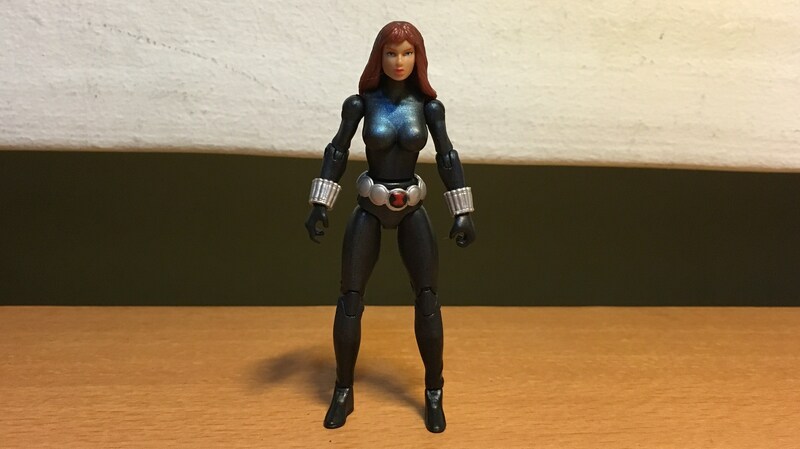 It is a reuse of MCU Black Widow catsuit buck, with a new head and belt. 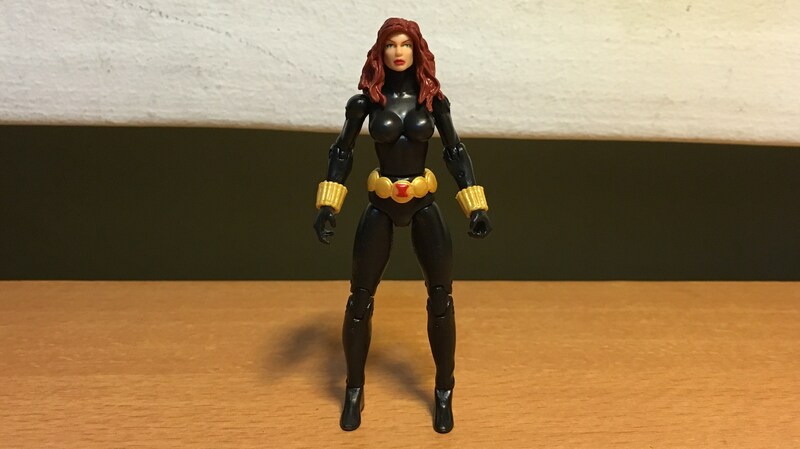 And this Black Widow was released as part of the recent Marvel Gamerverse line, she is an almost complete reuse of MCU Black Widow buck, except for her head, which is a repaint of Gamora’s head. Amazingly, Black Widow’s hairstyle looks just like that in the “Marvel Vs. Capcom” game. 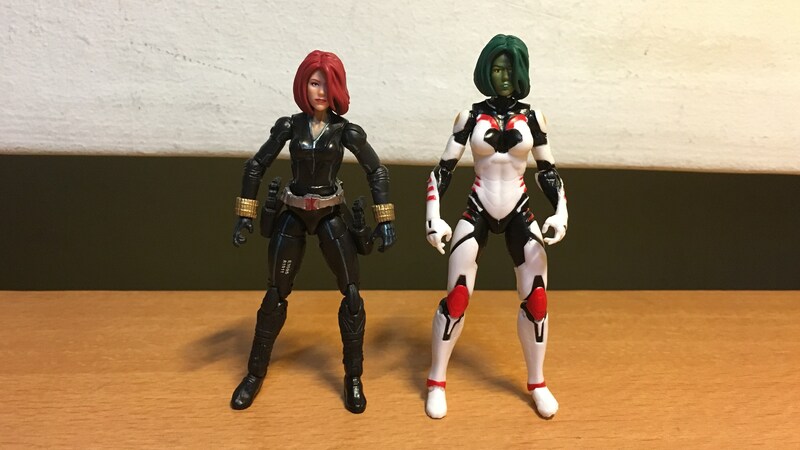 Comparison between Marvel Gamerverse Black Widow and Gamora. It’s such a clever re-use that it makes you think whether Gamora’s head sculpt was designed with Black Widow in mind. We have a special appearance by S.H.I.E.L.D. Agents Maria Hill and Sharon Carter (aka Agent 13). 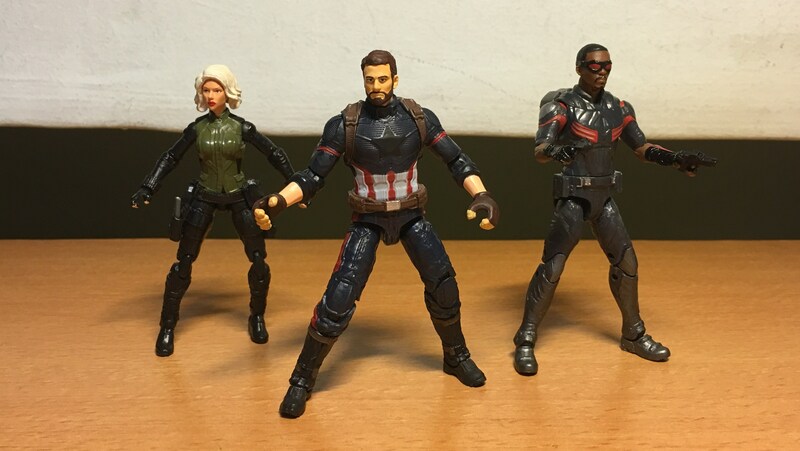 I am showcasing them here as they somewhat share the MCU Black Widow catsuit buck. 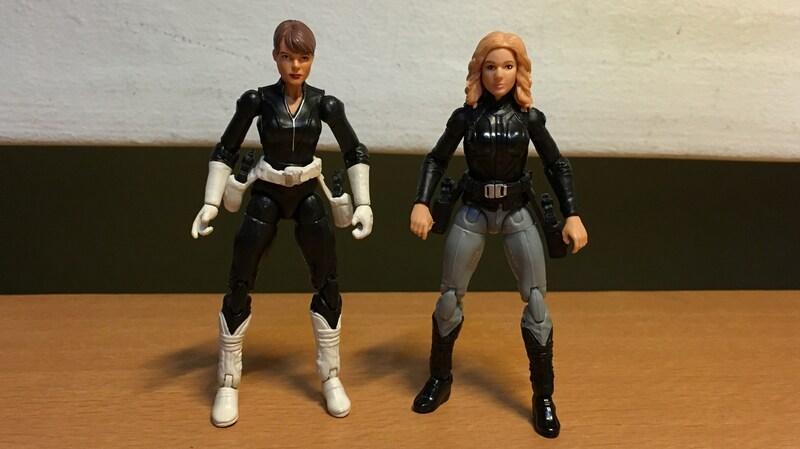 Maria Hill is a repaint of the Black Widow buck with a new head, while Sharon Carter uses Black Widow’s legs and belt together with a new torso and head. 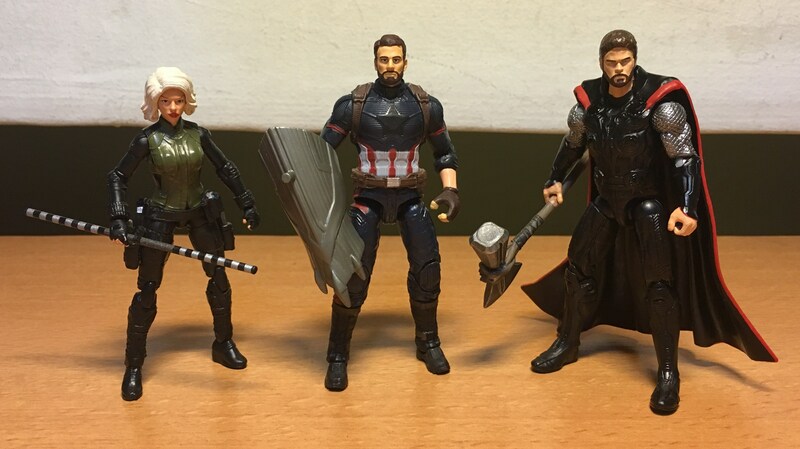 Heck, let’s just add Maria Hill and Sharon Carter to the mix. Femmes Fatale in action. 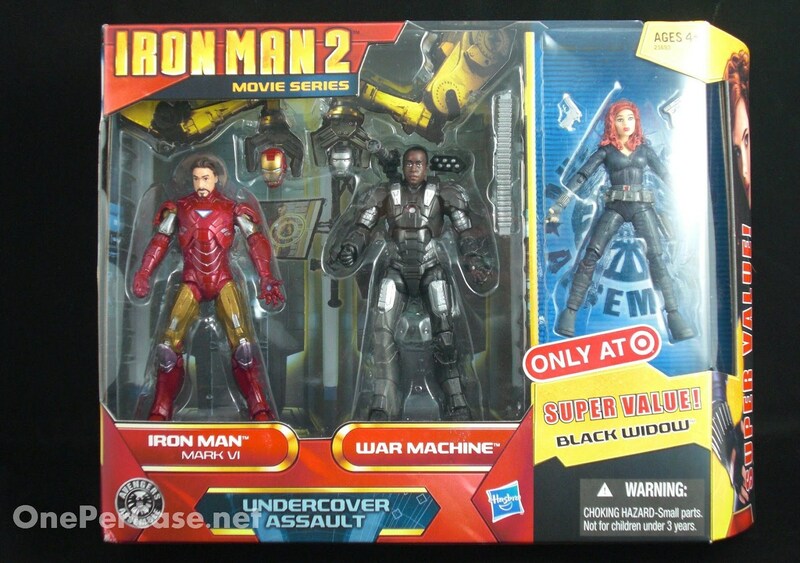 This is the cancelled Iron Man 2 three-pack box set of Iron Man, War Machine, and Black Widow. 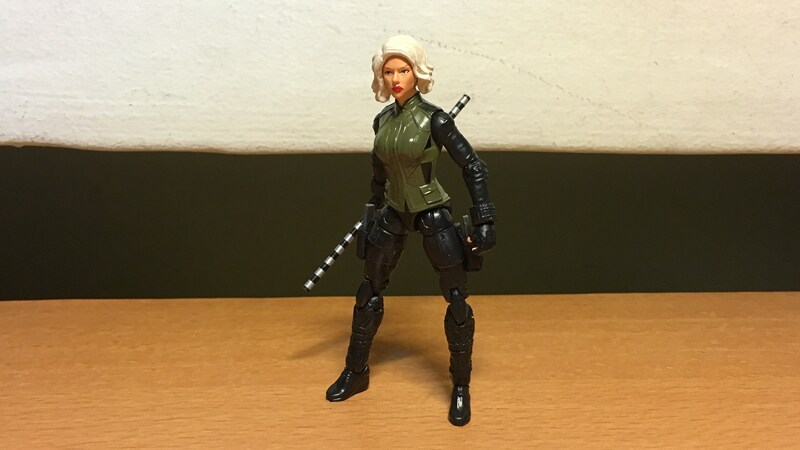 Had this been released it would have been the first MCU Black Widow figure. The reason for the box set’s cancellation was never announced, but somehow it managed to went on sale in the UK. Close-up comparison between “Iron Man 2” Black Widow and “The Avengers” Black Widow. 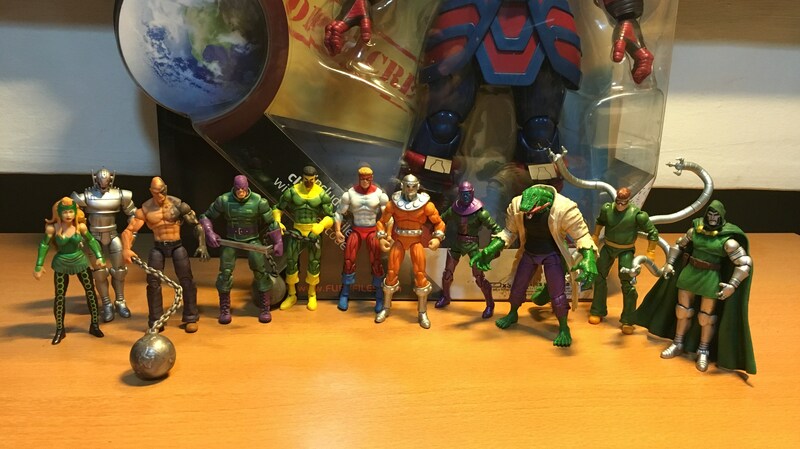 Picture from someone’s collection as posted on ToyArk forum here. 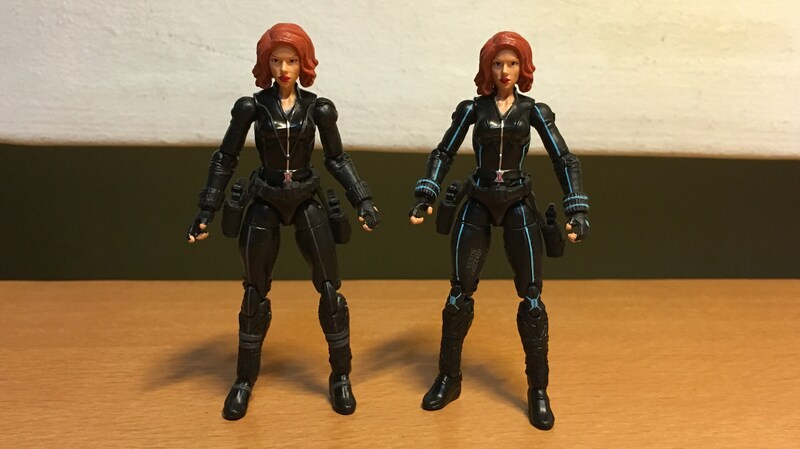 On the right is the “Short red hair variant” Black Widow, compared with the regular release on the left. 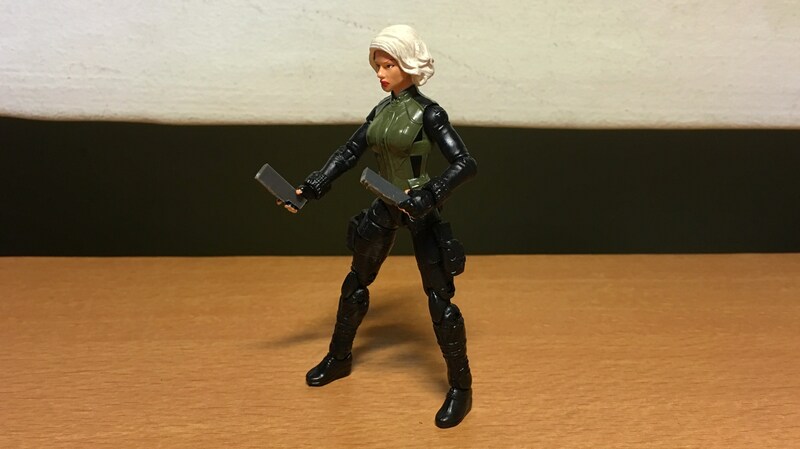 This is the “Blonde variant” Black Widow, and is thought to be Yelena Belova, a more recent character who also used the “Black Widow” name. 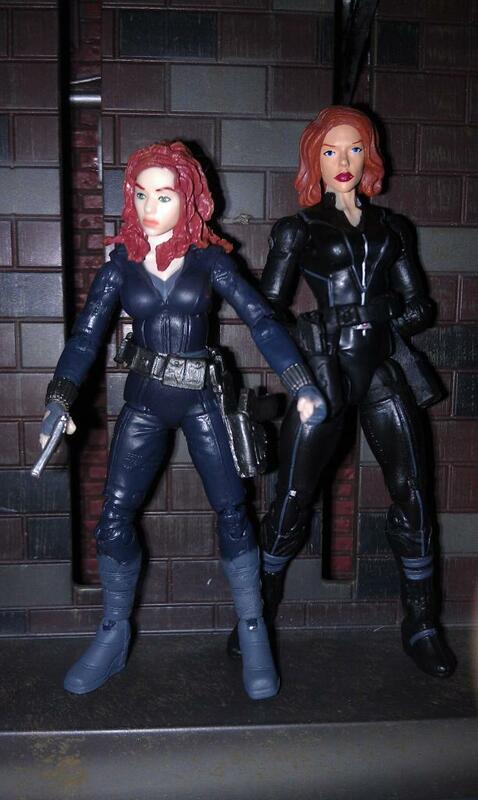 Based on the posts in ToyArk Forums, both of the above Black Widow variants were prototypes created when Hasbro considered releasing variant figures, but any such plans were cancelled. Instead, these prototypes were given to Hasbro employees, and subsequently some were sold to collectors. They are among the rarest MU figures, fetching exorbitant prices online if they were ever on sale. 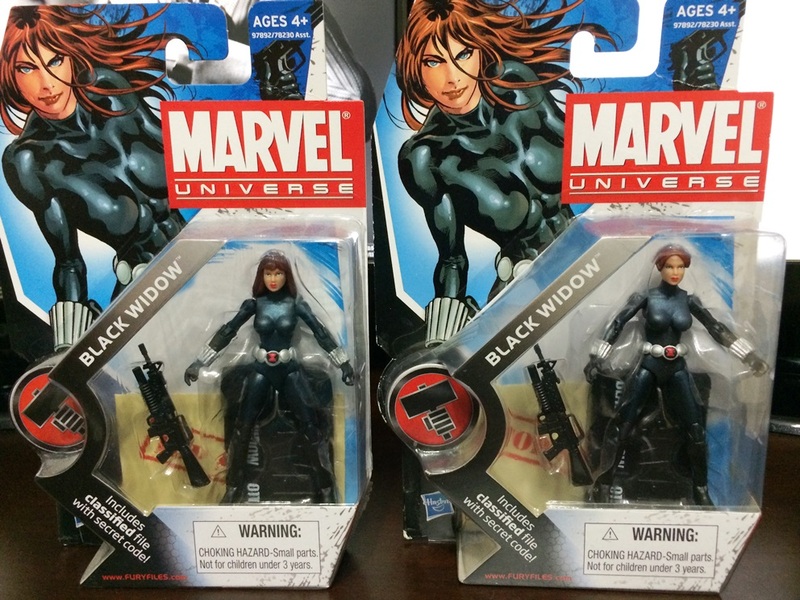 Pictures of Marvel Universe Black Widow variants from posts on ToyArk Forum. 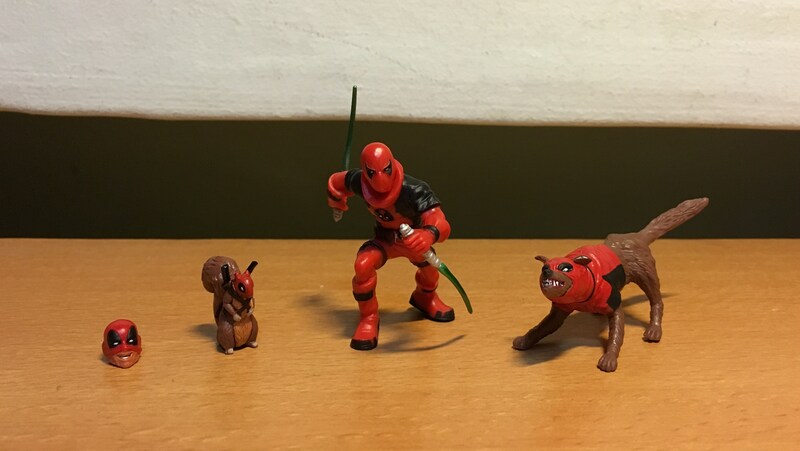 Following from last month’s showcase of my Deadpool Corps collection, I thought I’ll go through the Deadpool Corps just once more since, each figure was acquired piecemeal via various evilBay sources, and as such certain aspects could be different from that of the genuine Taco truck article. Bear with me here as I seek to clarify to everyone and myself what I consider is the backstory for each figure. Let’s start with Deadpool. Here’s a picture of Deadpool as purchased. Deadpool came from a ChinaBay source. 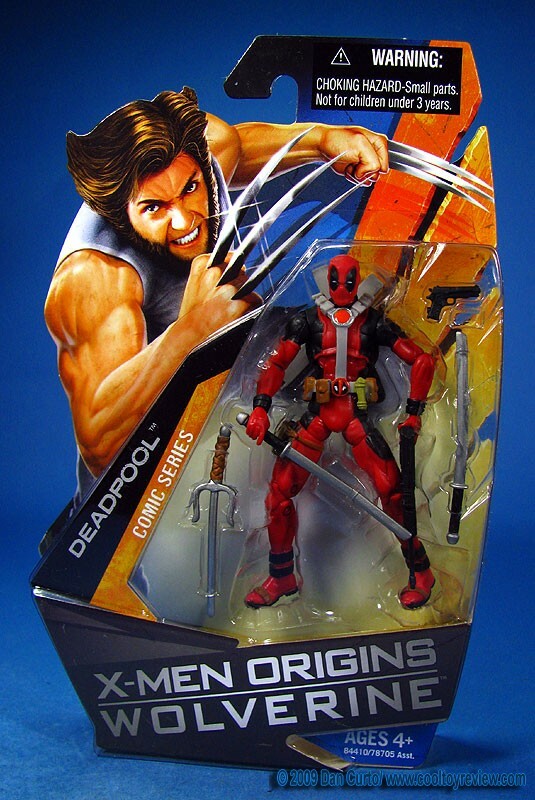 On closer inspection and after checking online for more information, I concluded that this particular Deadpool figure did not belong to the Taco truck set, but instead he comes from the single release comic series Deadpool of the “X-Men Origins: Wolverine” toy line. 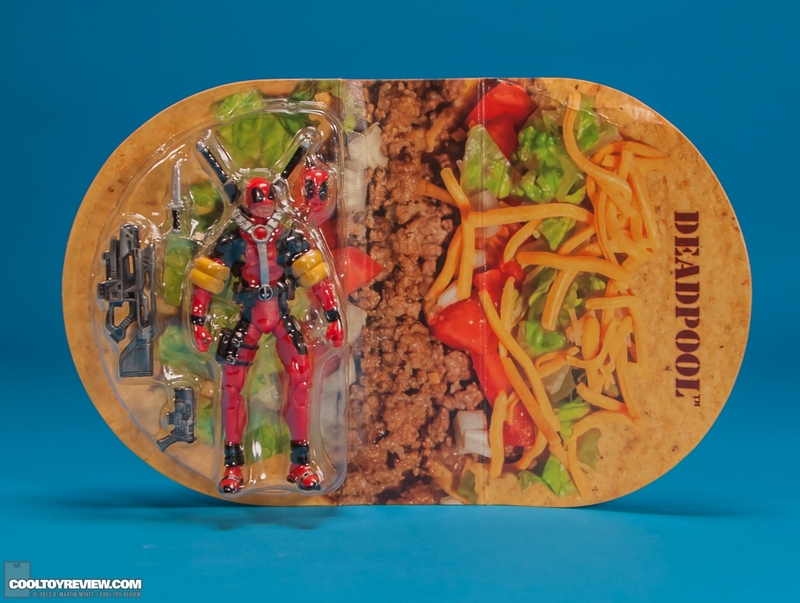 The original “Taco truck set Deadpool” has dark brown scabbards, holster, and belt pouches, and there’s no red on the Deadpool symbol belt buckle. Also, “Taco truck set Deadpool” comes with a dagger, two futuristic guns, swimming floats and inflatable Ducky. The original Deadpool from the Taco truck set. But as a consolation, the taco eating head does belong to the Taco truck set. The same two futuristic guns also came with MU Cable, so they can be borrowed for Deadpool to use. 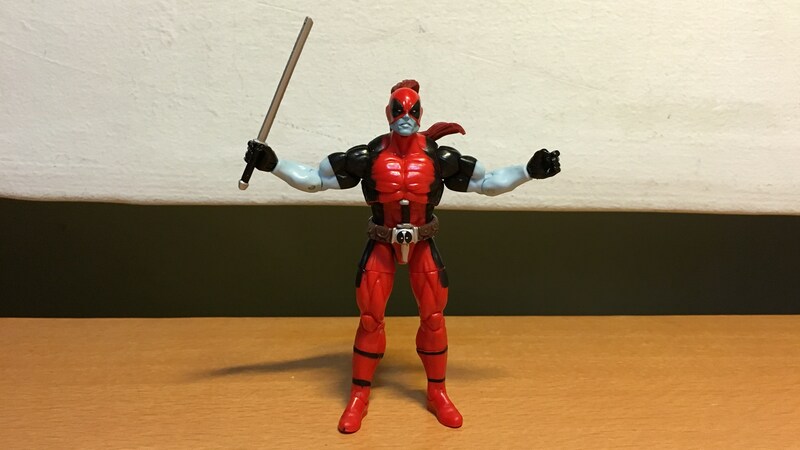 I have another Deadpool figure from the MU Deadpool & Taskmaster Comic Pack, and the masked head plus the dagger can be borrowed to snap the “Taco truck set Deadpool”. Just an observation: If Taco truck set Deadpool uses the same buck as the Comic Series Deadpool, then the holster on his leg will not fit that futuristic pistol. It does fit the dagger loosely though. It is possible to customise a Taco truck set Deadpool with a simple repaint, but for now I’ll just let Deadpool stay the way he is. 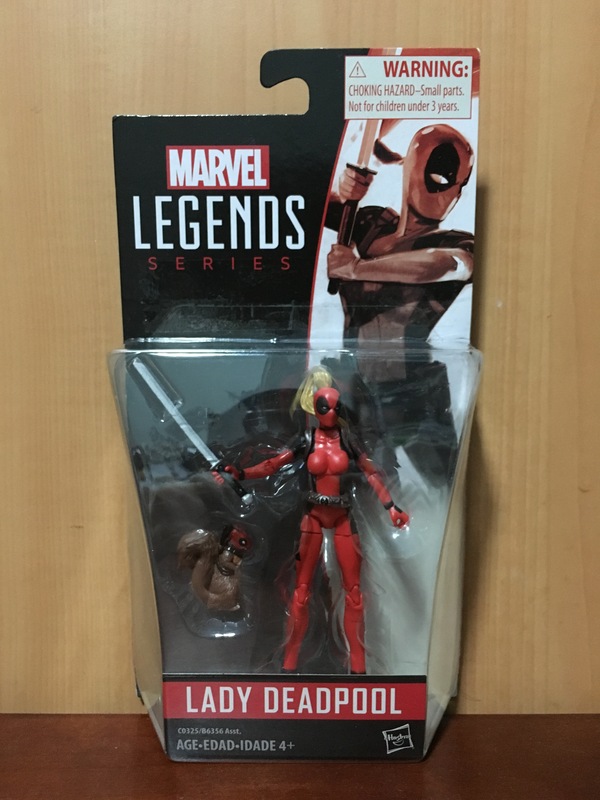 Lady Deadpool was re-released as part of Marvel Legends Series Wave 4. She came together with Squirrelpool. The original Lady Deadpool from the Taco truck set. 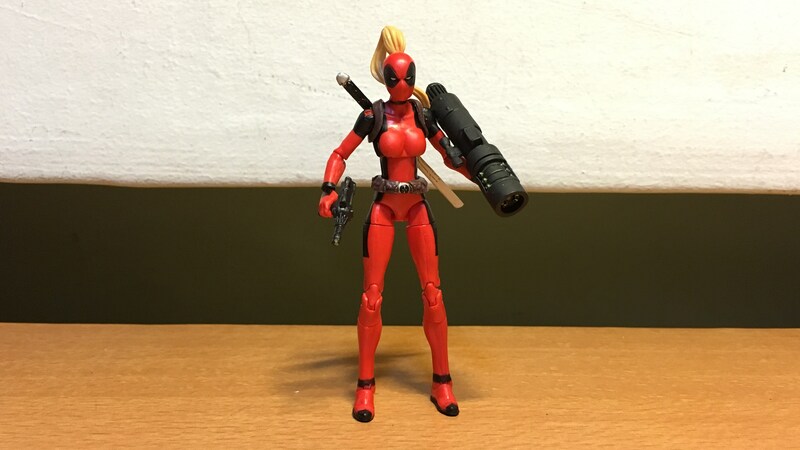 Perhaps the only significant difference between the two is that the original “Taco truck set Lady Deadpool” has a slightly darker hair colour as compared with the single release. There’s always a slight variation with every Hasbro MU re-releases, enough to irritate the completionist collector. 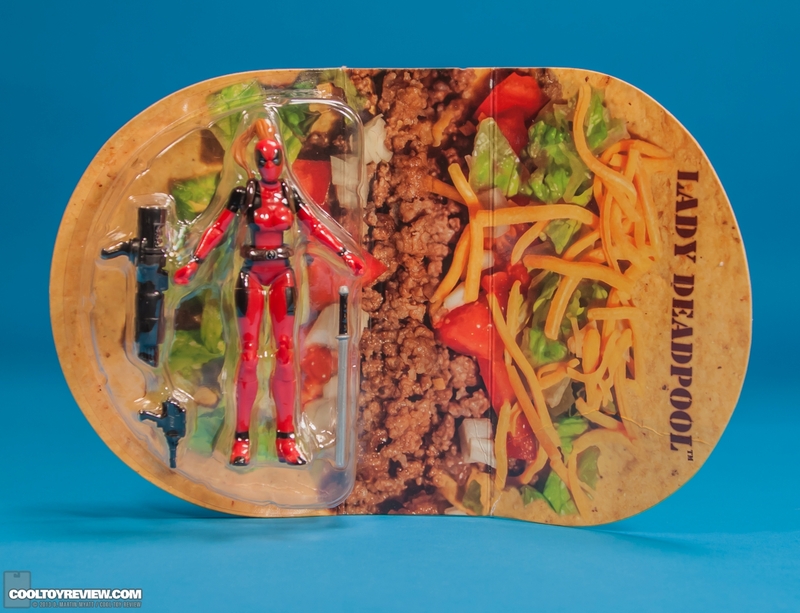 “Taco Lady Deadpool” also came with a laser gun and a bazooka. It so happens that the two weapons are the same accessories as that of MU A.I.M. Soldier, and I’ve borrowed them to snap a somewhat complete “Taco Lady Deadpool”. 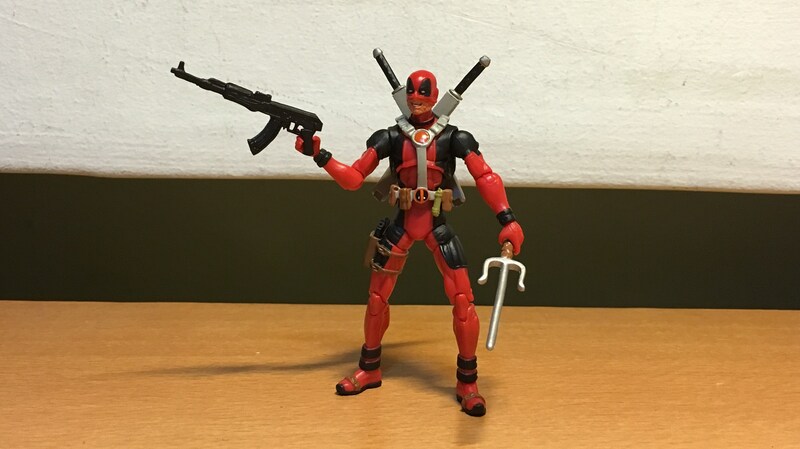 No issues on the completeness of Championpool and his accessories as he was purchased as-is from a trader who was selling it separately from the original Taco truck set. 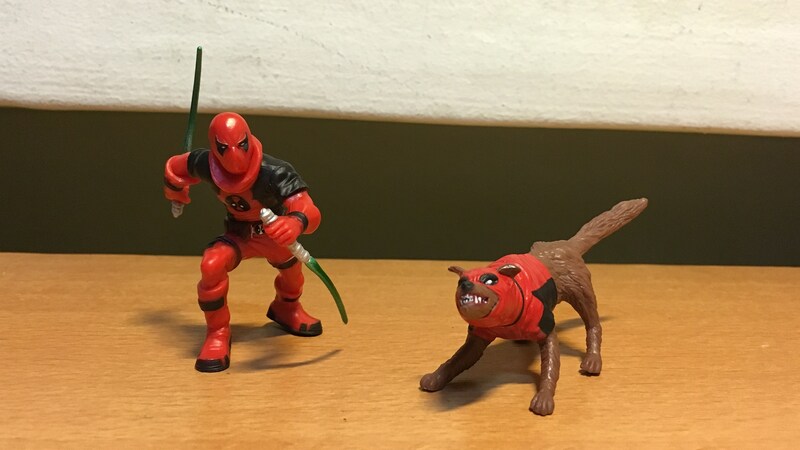 Also no issues with Kidpool and Dogpool. 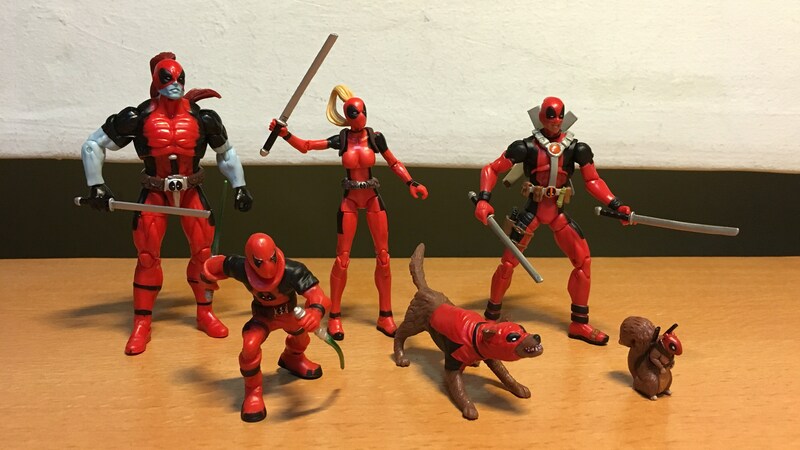 Together with the Taco eating Deadpool head, and probably the XOW: Deadpool itself, these are not considered knock-offs but are thought to be overproduction from the Hasbro-licensed factories in China that were never contracturally acquired by Hasbro for final packaging and sale. As such enterprising sellers are offloading them on evilBay, usually at a cheaper price than retail, which is either a bane or boon from a certain point of view. So there you have it. A somewhat convoluted piecemeal method to acquire the exclusive Taco truck set figures without overspending too much, with the end result of some slight paint differences and lacking certain accessories (Deadpool’s swimming float, Ducky, Taco packages and the Taco truck itself). Wouldn’t exactly be a preferred option if you are the compulsive completionist, but I’ll leave that up to you to decide. 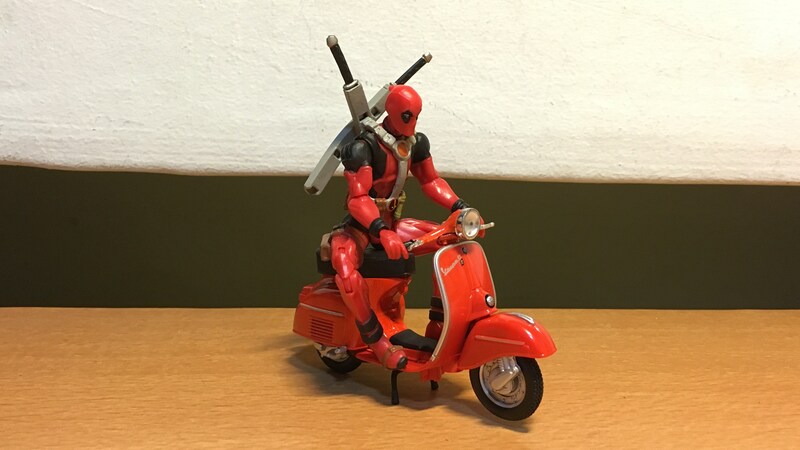 A word of caution if you are considering the cheaper ChinaBay route: There’s a knock-off Taco truck Deadpool set floating around which comes with the similar-looking figures but with seriously reduced articulation (no elbows or knee articulation), poor paint apps, among others. Beware not to mistake this for what you think you are going to get. FAKE, and probably toxic. 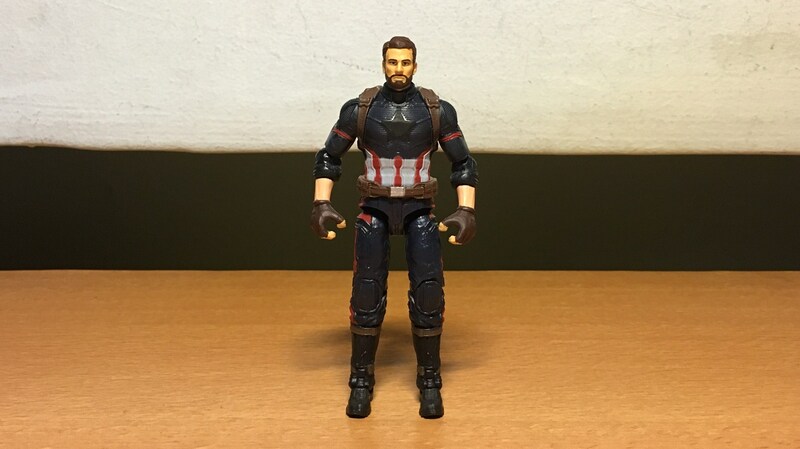 Picture from eBay.